A carte de visite from the collection of Helder Costa pictures Robert Fletcher, West Point Class of 1868. Feedback includes comments about the makes and models of guns featured in the last issue, and the identification of a soldier in one portrait—Col. Matthew McClennan of the 138th Pennsylvania Infantry. 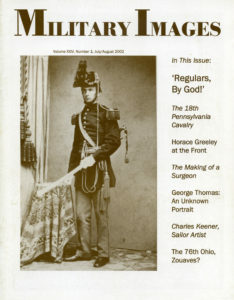 Seven publications are listed, including The Boys Who Went to War From Columbia University, 1861-1865 (Thomas Publications) by William C. Floyd and Paul Gibson, Gangrene and Glory, Medical Care During the American Civil War (University of Illinois Press) by Frank R. Freemon, Gettysbirg—The First Day (University of North Carolina Press) by Harry W. Pfanz, Uniforms of the Civil War (Lyons Press) by Robin Smith and Ron Field, New Hampshire in the Civil War (Arcadia Publishing) by Bruce D. Heald, PhD., All for the Regiment: The Army of the Ohio, 1861-1862 (University of North Carolina Press) by Gerald J. Prokopowicz and Battles & Leaders of the Civil War, Vol. 5 (University of Illinois Press) edited by Peter Cozzens. A sampling of sales from the popular auction site eBay is included. Portraits and brief accounts of the lives and military service of 7 soldiers, including Brig. Gen. Roger Jones Jr., 2nd Lt. Robert Fletcher of the 1st U.S. Artillery, Lt. Col. David Hammett Brotherton of the 25th U.S. Infantry, 1st lt. Tillinghast L’Hommedieu of the 4th U.S. Cavalry, Lt. Col. Andrew Hickenlooper, 1st Lt. James Calhoun of the 7th U.S. Cavalry and Maj. Gen. Harry Foote Hodges. Augustus Chouteau Paul, the son and grandson of career army officers, served in various capacities with the 2nd Kentucky Infantry (U.S.) and as a staff officer. His post-war career in the army ended abruptly in 1881 when he was court-martialed and dismissed for drunkenness. Several photographs illustrate the text, including an autographed carte de visite of Paul and an outdoor image of him with other soldiers at “Starvation Rock” in the Black Hills in September 1876. The story of Robert J. Yong of the 18th Pennsylvania Cavalry details his service in the regiment. It includes an anecdote about a fall from a horse that might have saved his life. Portarits of Young and his wife, Emma Sommers, are included. Portraits of 10 of Young’s comrades in arms are also featured: Capt. Enjos J. Pennypacker, Cpl. John Hoffacker, Capt. Samuel T. Tresouthick, Maj. Harvey B. Van Vorhis, Lt. Col. William P. Brinton, 1st Lt. James R. Weaver, 2nd Lt. John Winters, Lt. Harry Wilson, Pvy. Isaac Pownall and Pvt. Thomas F. Hendershot. The famed newspaperman visited a Union army winter camp and a photographer captured him in two outdoor views. An image of G.S. Warren prompted the author to investigate the subject’s uniform. Though it resembles the dress of the Veteran Reserve Corps, it is in fact the uniform of the Hudson River Institute, a military academy in Claverack, N.Y. Its graduates included author Stephen Crane. A quarter-plate tintype of David Auld, a drummer in the 43rd Ohio Infantry, is at the center of this story about a conversation overheard at a Civil War show and the excitement of identifying soldiers in regimental history books. Images include Auld, fellow musician John McClay, Corp. Isaac Jarvis of the 63rd Ohio Infantry and Pvt. Rice B. Bostwick of the 4th Tennessee Infantry. The soldier and his wife, Mary, are the author’s great-great uncle and aunt. Images of both ancestors illustrate a biographical sketch of Sgt. Adsit and his regiment. Capt. James Wilson of Company M, 12th Kentucky Cavalry, is pictured with a Henry rifle. His portrait illustrates a biographical sketch that describes Wilson’s skill and bravery during the fight at Horseshoe Bottom, Creasy Creak, Ky., on May 9, 1863. Vermont’s Charles Allen was better prepared than most period doctors to become a Union army brigade surgeon due to his education at Middlebury College and Castleton Medical College. During the Civil War he served a brief stint as the surgeon of the 9th Vermont Infantry. He went on to become a brigade surgeon in Washington, D.C., and administrator of U.S. General Hospital #2 in Beaufort, S.C. Two pre-war daguerreotypes illustrate the text. A previously unpublished view of the general in profile, credited to Morse’s Gallery of the Cumberland in Nashville, Tenn., is accompanied by background information by owner Al Rapp. He has documented at least 12 other poses of Thomas—but not this one. The author notes, “Henry C. Franklin was 138 years old when I first met him on a frosty Christmas Eve morning in Newport News, Virginia, in 1977.” Zeller refers to Franklin’s identification disk, which he found while relic hunting with a metal detector. Franklin, he discovered, served in Company C of the 2nd Vermont Infantry. Franklin purchased two disks and sent one home to his mother. He lost the other on the Virginia Peninsula in 1862. This disk, found by Zeller, is pictured along with a portrait of Franklin from the U.S. Army Military History Institute in Carlisle Barracks, Pa.
An 1873 portrait of Kenner and two of his drawings are accompanied by the story of his life and service as an assistant engineer in the U.S. navy. An analysis of the well-known image of Southern soldiers on the Confederate side of the Rappahannock River in Fredericksburg, Va., focuses on men in an attic window. 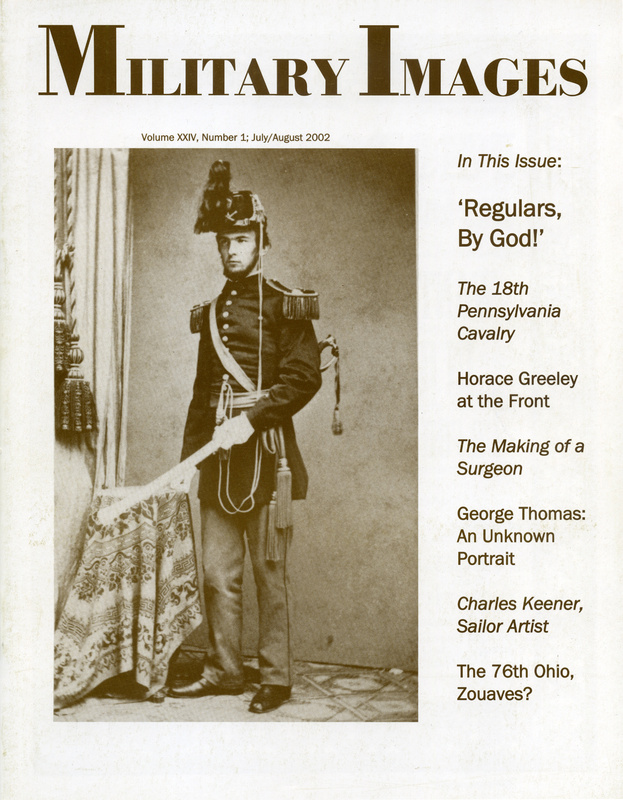 In “The 76th Ohio, or What is a Zouave,’” McAfee explores the specifics of the uniform of this Buckeye State regiment. It is illustrated with a carte de visite of Pvt. Lee Mathews of Company D.
An occasional column in which we publish images sent to the magazine by readers for identification includes a man who may be an Indian scout, a U.S. navy officer identified as Charles Gainer and a tintype of a family believed to have lived in Charleston, S.C.
A hard-plate image from the Roy Mantle collection is an outdoor view of a Union soldier seated on an officer’s mount. The soldier holds a saber and has a Colt Navy revolver tucked into his belt.